Kids book and read alouds on top. 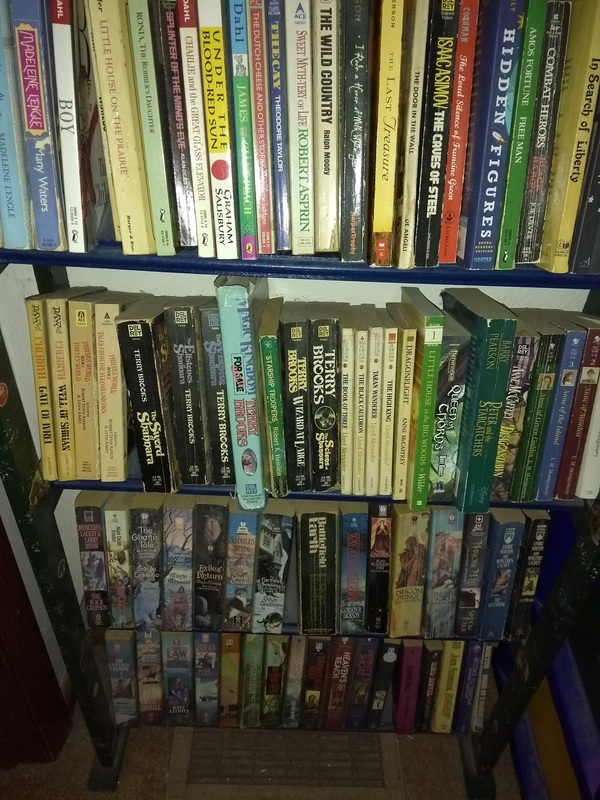 Fantasy and science fiction paperbacks on the bottom. It was my daughter’s gymnastics show tonight, and after three hours of sitting on tiny bleachers, packed in with all the other parents, siblings, grandparents, etc., my brain is just as tired as my body. It was a fun show, but three hours in those seats in rough. See you tomorrow with another review. As I’m getting more book reviews up, the ability to sort the reviews usefully is becoming more and more important. One method of sorting that I’m starting to realize might be useful is the length of the book. So, I’m going to lay out a couple of book length categories that I’ll be using from now on (and I’ll gradually go back and add these to all my old posts as well). Short stories are less than 30 pages long. A novelette is 30-70 pages long. A novella is 70-200 pages long. Normally it’s up to 160 pages, but anything under 200 pages seems short to me so I’m including it in the novella length. Kids books count as novellas if they end up in this page count. A novel is anything 200 pages or longer. I’m not going to label this length, although I will put a special tag if the book is more than 500 pages long or more than 1000 pages long. It’s just a bit of formatting, but if I put up a post, I can reference the lengths and be consistent going forward. I’m taking a bit of a break for Thanksgiving. My family lives only an hour away so we won’t be traveling far, but we will be visiting for several days. See you after the weekend! Well, I’ve morphed from testing to treatment so life isn’t quite as crazy these days as it was during July. I’m going to start posting again, although it won’t be as regular as I go through chemo. If you’re interested in what’s going on in my fight against the cancer, you can check out my other blog: Young and Battling Breast Cancer. I’ve been writing book reviews for myself so I have a bit of a backlog to get on the web. First one to follow shortly.